Well, here it is! 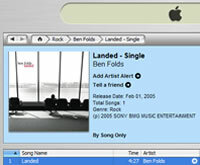 The official release date for Ben Folds' "Landed" is upon us, and you can now download it in all its high-bitrate glory from the various online music stores such as iTunes and MSN Music. Well, if you're American anyway. Neither iTunes nor MSN music seem to be carrying the song outside of the US, and with the almost stealth-release of the song (no CD, minimal publicity) it doesn't look like it's coming overseas anytime soon. That said, if anyone finds a non-US source for the download, then please let me know! Oh, and in other news, the official site has been updated with the cover art for the single, and a short sample in place of the old "Super D" snippets that plays when you are browsing around.